Is China getting hit with THE BIG ONE? There has been a lot written on the Chinese stock market in the past few weeks. In case you missed it, CNN Money has a summary of what has happened here and J J Zhang of Marketwatch has a great on the ground view of investor attitudes here. 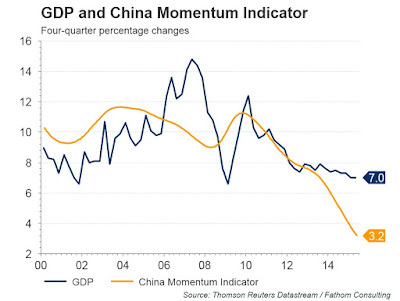 ...it seems that the market meltdown may have pushed Chinese economy to past its tipping point as well. FT Alphaville helpfully put the full Bridgewater note on their website here. To put those remarks into context, you have to understand Ray Dalio`s framework of analysis, which was revealed in his "beautiful deleveraging" thesis. In the wake of the Great Financial Crisis, Dalio believed that there are three broad possible policy responses: government austerity, financial restructuring, aka debt writeoffs, and quantitative easing, aka money printing. You can see him outlining his thoughts on this issue in writing here and in the video below. If I were to add to Dalio`s analytical framework, I believe that we can describe the global economy as undergoing a process of deleveraging, which can take years and possibly over a decade to accomplish. In big picture terms, the US is the furthest along (and undergoing the "beautiful deleveraging" that Dalio described). Europe is still struggling and they are in the middle of the deleveraging process. China is just beginning the process after experiencing an unprecedented period of credit driven growth. Our views about China have changed as a result of recent developments in the stock market. We previously conveyed our thinking about the debt and economic restructurings as being negative for growth over the near term and positive for growth in the long term - i.e., that it is a necessary and delicate operation that can be well managed. While we had previously considered developments in the stock market to be supportive to growth, recent developments have led us to expect them to be negative for growth. While we would ordinarily consider the impact of the stock market bubble bursting to be a rather small net negative because the percentage of population that is invested in the stock market and the percentage of household savings invested in stocks are both small, it appears that the repercussions of the stock market`s declines will probably be greater. Because the forces on growth are coming from debt restructurings, economic restructurings, and real estate and stock market bubbles bursting all at the same time, we are now seeing mutually reinforcing negative forces on growth. While at this stage it is too early to assess how strongly the stock market`s decline will pass through negatively to credit and economic growth, we will soon have indications of this. We will be watching our short-term indicators of Chinese credit and economic growth carefully to see what the pass through to the economy of these developments is lie, and we will continue to share our thought about what is happening. Since the linkages in China are broadly analogous to those in other countries that we do have good perspectives on, it is worthwhile to look at the dynamic with this perspective in mind. This is the same perspective as we have taken in looking at China`s debts and economic situation. The negative effects of the stock market declines will come from both the direct shifts in wealth and the psychological effects of the stock market bubble popping. Though stock prices are significantly higher than they were two years ago, the average investor in the stock market has lost money because more stocks were bought at higher prices that were bought at lower prices. We now estimate stock market losses in the household sector to be significantly -- i.e., about 2.2% of household sector income and 1.3% of GDP. However, these losses appear to be heavily concentrated in a small percentage of the population as only 8.8% of the population owns stocks. These are rough estimates. We don't know who is experiencing what losses. Such information usually surfaces in the days and weeks after the plunge. Even more important than the direct financial effects will be the psychological effects. Even those who haven't lost money in stocks will be affected psychologically by events, and those effects will have a depressive effects on economic activity. Unless the government is prepared to shoulder the ultimate stock-market related losses by itself, via CSFC or other vehicles, various financial products funding the leverage may suffer from trillions of Rmb losses when the dust finally settles, by our estimate. Given the particularly-thin capital base of the front line FIs, including brokers, trusts and TAMCs, we suspect that it’s a matter of time before banks may have to face the music – bank WMP is by far the largest indirect leverage provider. Banks can decide, voluntarily or forced by the potential of social unrest, to take the losses on their book, which means their capital base would suffer severely. If they decide to pass on the losses to WMP buyers, we expect the shadow banking sector to wobble. We believe that the natural reaction of WMP buyers is to stop buying, given that they have been buying based on implicit guarantees and have little visibility as to which products are supported given the low transparency in the financial system. That effectively would be a bank-run in China’s shadow banking sector because bank WMP is by far the largest “depositor” in the shadow bank. It’s possible that banks may take the losses on their books without explicitly acknowledging it, i.e. not marking to the market. In this case, we expect them to be much more cautious granting loans going forward as they would know their balance sheets are weak – that’s how the Japanese banks behaved post the bust of the property bubble. Whichever way we look at this, what just happened in the A-share market will likely have profound impact on China’s economy and financial system one way or another, by our assessment. If house prices fall by 15% or more, then we think that we are likely to get a hard landing and the authorities risk running out of fiscal firepower. We suspect that if house prices fell by that much, then the LTV threshold would be absorbed. Moreover, with housing contributing to a third of local government revenue, 56% of banks’ collateral and around a fifth of GDP, the knock-on impacts could be immense. Twice in the past, NPLs have risen above 20%. If this were to happen again, on the current credit-to-GDP ratio, the cost of recapitalising the banks could easily be 50% of GDP, not to mention the deterioration in the fiscal position on account of the loss of fiscal revenue. At that point, most of fiscal flexibility would be used up; however, the authorities would still have the ability to expand monetary policy, cut rates and RRR. The second catalyst we see for a hard landing would be if deposit growth at banks stopped [now the lowest on record at just 6% with external liquidity in the form of FX flows drying up], as this would essentially limit the ability of banks to roll over loans to SOEs, in our opinion. I have seen comments in the past that "the government" is large and rich and it can afford to pay for these losses. Recognize that "the government" is just a transfer mechanism between different sectors of the economy. In this case, should "the government" socialize the losses, it will be ultimately be the household sector that bears the burden of adjustment. In that case, what happens to the the objective of re-balancing to the consumer and the path of future economic growth? A recent Quartz article highlighted a disturbing divergence spotted by Wei Yao of Société Générale. He found that bank loans are falling. But how does bank credit decline in the face of 7% GDP growth? We can argue that Chinese statistics are made up, but to characterize them as just "made up" is wrong. "Distorted" might be a better description. In the end, the figures have to balance. To unpack what Balding means, a company that can’t pay back a loan has a few options. It can fire workers and sell off assets, file for bankruptcy, borrow from someone else to cover the debt, convince the bank to extend the loan for another year or so, or get the bank to lend it even more money. Why would a bank manager do the latter two options? Insolvent loans put bank managers in a tough spot. Cut off the money, and when that customer defaults the bank has to write that money off. That could cost the manager her job. This is why these companies are dubbed “zombies”—keeping them on a steady drip of financial life-support prevents the dead from truly dying. The gap between credit and investment suggests this is happening. The reason banks are so hungry for more money is because, quite simply, they’re not being paid back. This is potentially a big problem for China’s growth outlook; bank loans account for three-quarter of China’s total financing. That compounds itself—slower growth makes it even less likely that banks will eventually get paid back. As more and more money shifts toward keeping “zombie” companies alive, there’s less and less that can go to entrepreneurs and households that could really use it. But the horror movie analogies don’t stop there. When debt hits a certain level, an economy starts to cannibalize itself, devouring its own potential. Credit that could support good companies goes to postpone defaults. Corporate profits go to pay off debt, and aren’t reinvested in expansion. Shriveling demand drags down prices. To summarize. Ray Dalio believes that China has hit the tipping point and its stock market crash is the trigger for a debt unwind. Under such circumstances, the natural reaction of the fiscal and monetary authorities is to try to prevent a Russia, Lehman or Creditanstalt Crisis style meltdown of the financial markets. Beijing seems to be well down that path and they appear to be adopting the Japanese solution of corporate zombification. Such a course of action would imply that the household sector would bear the most of the burden of any adjustment. Economic growth would therefore have to decelerate sharply. The same-old-same-old model of debt financed infrastructure spending is broken. The economy will be unable to shift to the Third Plenum objective of re-balancing to the consumer because the consumer will have to bear the cost of all these bad debts, either in the form of further financial repression, higher taxes, or other measures. Despite all these problems, China should be able to achieve a soft landing. I have also heard the comment that describes a Chinese landing as “hard on the outside and soft on the inside“. China will achieve a soft landing (inside the country). On the outside, however, the countries and companies doing business with China will not be so fortunate (hard landing for outsiders). Taiwan is seeing its manufacturing outlook darken. The Singaporean economy flipped to contraction in 2Q.. Emerging markets are caught by the double whammy of slowing Chinese growth and Fed tightening. In the US, latest earning season warned of disappointing corporate developments in China. Numerous companies as diverse as CAT, UTX (capital goods), COH, YUM and GM (consumer) will be affected should Chinese growth nosedive. Despite the upbeat AAPL earnings call message about China, BI recently highlighted a Cowen research note indicating that Chinese iPhone demand was light. Longer term, however, slowing growth is likely to result in an American Renaissance as cheaper input costs from lower commodity prices and an onshoring revival sparks US growth (see my previous post How inequality may evolve in the next decade). Over the next few quarters, however, the markets will likely focus more on the negative effects of this transition. Spreadsheets will have to get revised with lower growth projections and risk premiums ill rise (and PE ratios will fall). That is, of course, assuming that you accept the Bridgewater thesis that China is unraveling and the Chinese economy is getting hit with THE BIG ONE. "I think there will definitely be an impact," said Ken Yeh, director at Acquavella Galleries and former chairman of Christie's Asia. "Chinese collectors have become a very important part of the market." Even before China's recent stock-market slide, there were signs that some Chinese collectors were paring back their spending. According to Artnet, total art sales in China and Hong Kong fell 30 percent in the first half of 2015 to $1.5 billion from $2.2 billion. During the spring sales in Hong Kong, "I heard many dealers talking about how weak the sales were. It's definitely down," Yeh said. While some market watchers are drawing comparisons to the Japan-led art boom of the late 1980s, which crashed with the Japanese property market in 1990, others say today's art market is far more diverse and durable. Even if the Chinese collectors put down their bidding paddles, buyers from the U.S., Middle East and Europe will step up in their place. "In the late 1980s, the market was so much smaller," Gyorgy said. "The Japanese were just about the only ones buying. Now we're working with collectors in Asia, Latin America, the U.S., Europe and so if one segment goes away, another segment comes back." Yes, but what if the deflationary effects of a slowdown in the Chinese economy spreads globally? Yet the big test for the market will be in October and November, during the fall sales in Hong Kong and New York. Last fall, Sotheby's and Christie's sold $1.78 billion worth of art, with many of the bids coming from Chinese buyers. Gyorgy said all it takes is one weak auction to damage the already fragile confidence of Chinese buyers. "Everyone is going to be watching this very closely," she said. "Art is as much a psychological market as a financial one. If there is one sale that isn't strong, people get spooked." If you want the real-time market reaction to any possible China slowdown, watch this chart of Sotheby`s. Bank of Canada Governor Stephen Poloz called the persistent weakness in Canada’s non-energy exports “puzzling” in the central bank's latest assessment of the economy. And a former colleague of the central bank governor at Export Development Canada (EDC) is confused by the shortcoming in exports as well. “We can attribute some of this. But a bunch of it we can’t,” Governor Stephen Poloz told reporters in the question and answer session that followed the Bank of Canada’s second rate cut of the year. 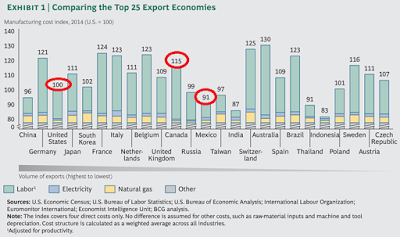 After crude oil and natural gas, Canada's largest exports to the U.S. include vehicles, machinery, and plastics. Peter Hall, vice president and chief economist of Export Development Canada, says the lower loonie is only an effective stimulant to the export economy when it coincides with a groundswell of demand from our neighbours to the south. The problem, he explains, is that groundswell hasn’t materialized despite a bevy of strong U.S. economic indicators. “They’ve got job growth. They’ve got real income growth. They’re confident again. They’ve reorganized their debts, and they have lower gas pump prices that are giving them $100 billion extra to spend. Put that all together. They should be spending. What are they doing? They’re saving at the moment. They’re as nervous as everybody else about the wiggles in the economy after six years of flat performance,” said Hall, who worked alongside Poloz at EDC for nine years. Here is the reasoning. The Canadian economy is reasonably well diversified between the resource producing regions and the industrial heartland. When commodity prices boom, the resource provinces benefit and the CADUSD exchange rate rises. When they retreat, the exchange rate falls, which makes the manufacturing centres more competitive, which raises exports to Canada’s largest trading partner, the United States. Canada’s non-resource exports have “faltered” of late and remain “a puzzle that merits further study,” according to central bank Governor Stephen Poloz. One thing is clear, however: Canada’s share of U.S. goods imports has eroded over the past four decades. “Notably, the U.S. now imports roughly equal dollar amounts of goods from Mexico and Canada, versus 10 years ago when they brought in $1.70 (U.S.) from Canada for every $1 from Mexico,” Robert Kavcic, senior economist at BMO Nesbitt Burns, said in a note. I addressed this issue in a post in early June (see Uh-oh Canada!). The competitiveness of Canadian manufacturing has markedly deteriorated between 2004 and 2014. A BCG study showed that the cost structure of Canadian manufacturing is behind that of its NAFTA partners, the US and Mexico. The Canadian Dollar, or loonie, would have to fall to between 0.72 and 0.78 before it starts to become competitive with these other countries. 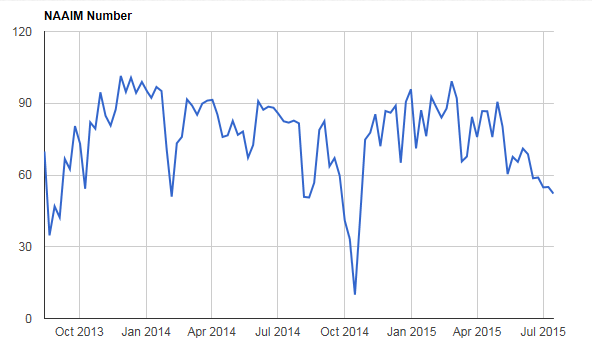 Since I wrote that blog post, CADUSD has fallen to below 0.78. Canadian equities have fallen as well. 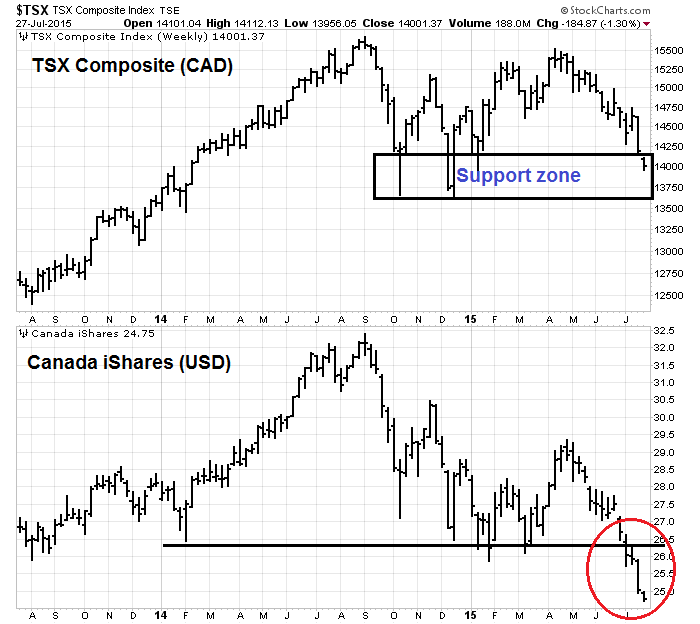 The chart below depicts the TSX Composite (priced in CAD) in the top panel and Canada iShares (EWC, priced in USD). The TSX is holding at a key support zone, but a look at the USD denominated ETF shows that it has violated support. What now, should you buy Canada? I may have left out one or two, but this is an extremely small list and some of these stocks are not very liquid. The two large caps on that list are Bombardier (aircraft manufacturing) and Magna (auto parts). The rest are mainly software service providers with a global customer base. Is that all that’s left of Canadian manufacturing? I deliberately left out companies that are unlikely to significantly benefit from a falling loonie because its costs are not in Canadian Dollars, such as Thomson Reuters, whose operations are not really located in Canada, Restaurant Brands International, which operates Burger King and Tim Hortons and Lululemon, which produces its products mainly in Asia. 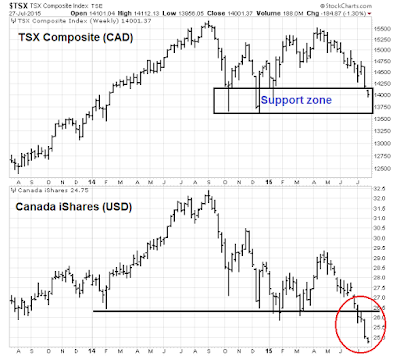 Given current macro conditions, why on earth would anyone want to buy Canadian equities? As for the loonie, I have estimated the equilibrium rate at between 0.72 and 0.78. However, we know that markets overshoot equilibrium. I would therefore be not surprised to see the loonie trade at 0.65 or even lower before the current adjustment period is over. Even though I live here, my inner investor continues to prefer US over Canadian assets as much as possible. I've been thinking a lot about how US Dollar strength has affected the markets. 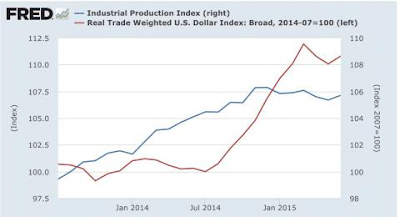 New Deal democrat wrote an intriguing post last week indicating that the strength of the USD explains the combination of a weak industrial recession and a robust consumer. If we were to accept that currency-based explanation of the US economy and markets, then USD strength is in effect doing some of the Fed's job of tightening. At about the same time, Jim Paulsen of Wells Capital Management expressed some concern that the financial markets may be in for a rude awakening when the Fed finally raises rates. In the meantime, Trend Model readings have improved from "risk-off" to "neutral", largely on the back of a better eurozone growth outlook and the reduction of Greek tail-risk. When I put it all together, it suggests that US equity markets are likely to chop around in a range-bound pattern for a little longer until the Fed finally starts to raise rates, which will probably be in September. 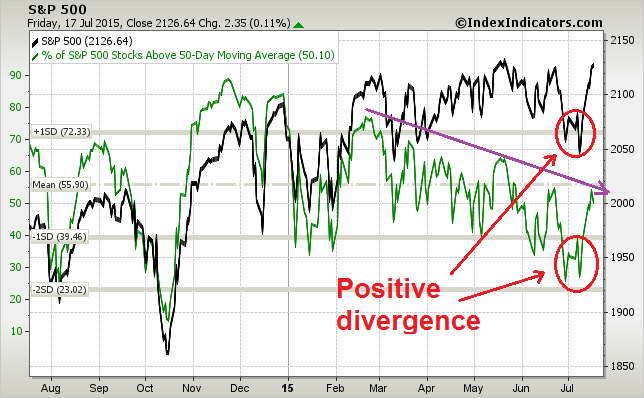 That could be the signal for the negative breadth divergences to resolve themselves into a long awaited correction. However, I would view the current bullish trading signal purely as a tactical call and in the context of the formation of an intermediate term top (see my previous post Why I am bearish (and what would change my mind)). Last week, New Deal democrat highlighted a fascinating New York Fed study of the effects of USD appreciation. 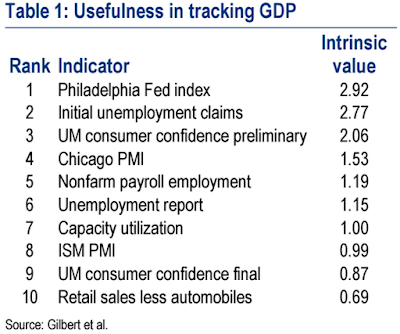 In that study, they modeled the GDP growth effects of a 10% appreciation in the USD. Of course, appreciation of the US$ doesn't happen in isolation, but the effect is significant enough that it can tip an otherwise soft economy into recession. 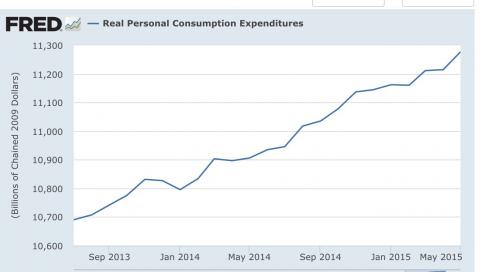 These effects are consistent with the shallow industrial recession that he has been observing, whose negative effects have been offset by a strong consumer. 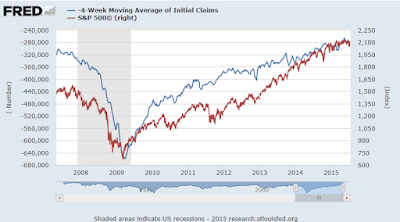 Market action has certainly been consistent with this hypothesis. 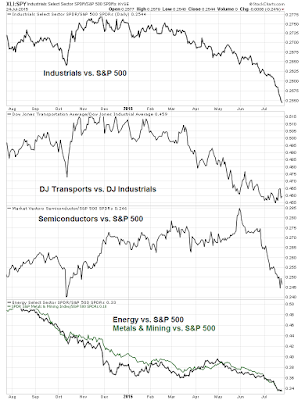 A glance at the market leadership show that cyclical stocks have been lagging the market, which is reflective of a shallow industrial recession. 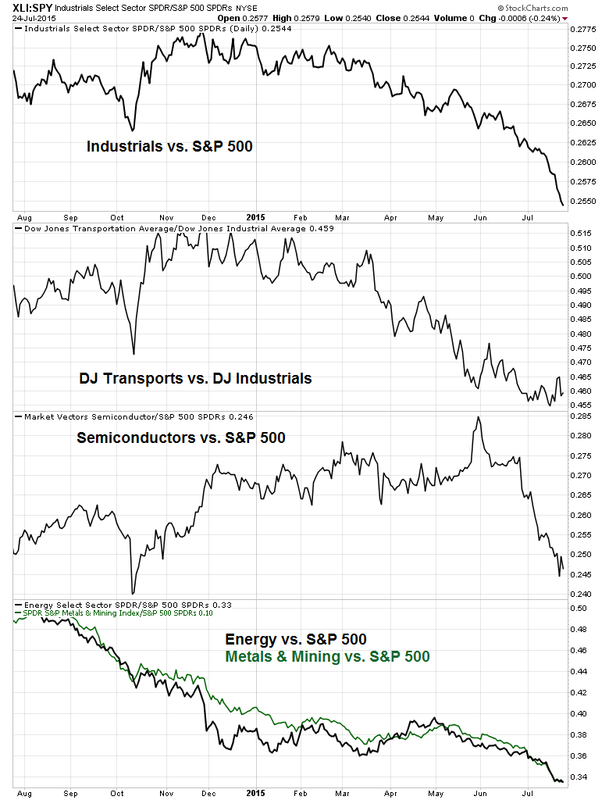 The chart below depicts the market relative performance of cyclically sensitive industrial, semiconductor and resource stocks relative to SPX, as well as the relative performance of the DJ Transports to the DJ Industrials. All of these groups are underperforming. By contrast, the market leaders have been Consumer Discretionary stocks, high-beta glamour stocks (which I warned about last week as being extended, see A warning for growth investors) and financials. Consumer Discretionary outperformance is no surprise under the circumstances. High-beta leadership is a little worrisome, especially in light of its narrow breadth. The outperformance of financials appear to be related to the expectation of better margins from higher interest rates. 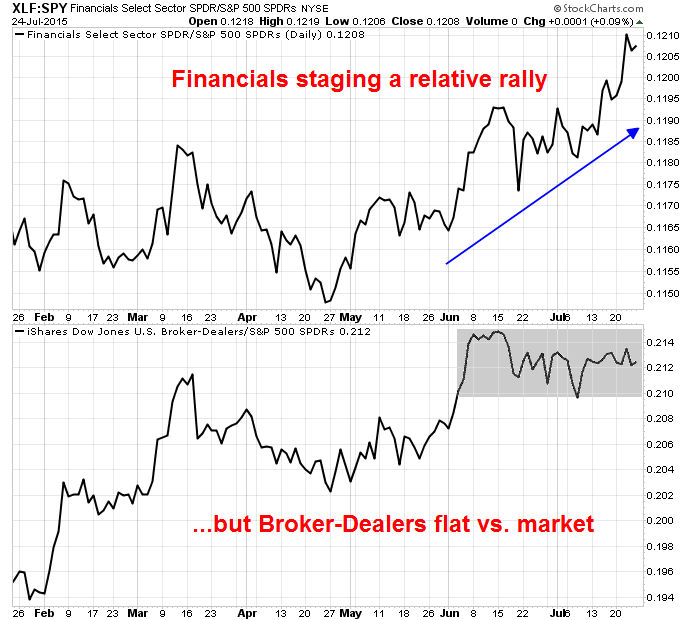 The chart below shows the relative performance of the financial sector, which are mainly large banks, and the relative performance of broker-dealer stocks. If the bulls were truly in charge of the tape, then we would see the leadership of financial stocks accompanied by its high-beta group, the broker-dealers. 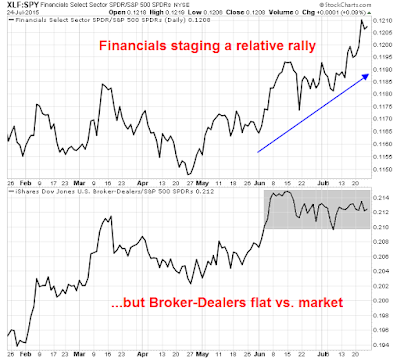 In this case, the broker-dealers have not participated in the relative rally in the last couple of months and they have performed in-line with the market in that period instead. A stronger dollar makes U.S. imports relatively cheaper than domestically produced goods, which pushes consumers to substitute towards imported goods and provides firms with relatively cheaper inputs from abroad. Though both consumers and importing firms benefit from lower import prices, the data show that the extent of the benefit is limited because exchange rate movements are not fully passed through into prices seen by U.S. buyers. 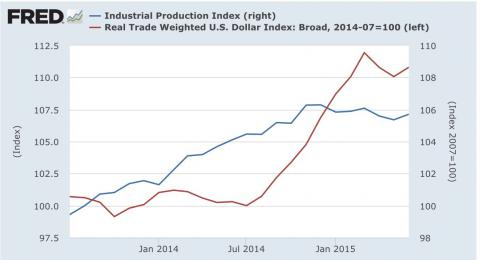 We estimate that a 10 percent rise in the dollar results in a 3.8 percent decline in nonoil import prices. Instead of adjusting prices charged to U.S. consumers by the full exchange rate change, firms exporting to the United States adjust their profit margins. Because import prices do not adjust by the full extent of the appreciation, the increase in demand for import quantities in response to the appreciation is moderated. The New York Fed trade model suggests a 10 percent appreciation of the U.S. dollar in one quarter (which then persists) results in 0.9 percent increase in real import values, as shown in the table below. On the export side, a stronger dollar makes the price of U.S. exports more expensive when converted into foreign currency terms, reducing U.S. export growth. In order to try to maintain competitiveness, U.S. firms adjust their markups rather than pass on the full exchange rate appreciation into foreign prices. That is, U.S. exporters take a hit on their profit margins in order to maintain market shares. The New York Fed trade model suggests that a 10 percent appreciation of the U.S. dollar is associated with a 2.6 percent drop in real export values over the year. Consequently, the net export contribution to GDP growth over the year is 0.5 percentage point lower than it would have been without the appreciation and a cumulative 0.7 percentage point lower after two years. In other words, a rising USD has a similar effect as raising interest rates. The strengthening exchange rate has, in effect, done some of the Fed`s tightening work for it. If it were to raise interest rates this year, the US economy would suffer the double whammy from the effects of rising currency and rates. Moreover, the divergent path taken by the Federal Reserve compared to the other major central banks of the world would put further upward pressure on the US Dollar. Jim Paulsen of Wells Capital Management expressed concerns that, unlike previous episodes when the Fed raised rates, the markets may be caught off-guard this time. Several aspects surrounding today’s stock market make it appear abnormally vulnerable as the Fed begins the process of finally raising interest rates. First, the current price/earnings (P/E) multiple is among the highest of any Fed initiation cycle. Second, investor sentiment is probably a bit too calm since the stock market has not experienced a correction for more than 900 trading days, the third longest in post-war history. Third, the Fed begins this tightening cycle from the lowest unemployment rate of any post-war recovery. Finally, tightening begins when corporate profit margins are near historic highs and while earnings growth is already well past its best growth rates of the recovery. Perhaps the stock market will be little affected by the Fed finally lifting interest rates from zero. However, these notable vulnerabilities suggest at least some period of stock market turbulence as the Fed begins to normalize monetary policy. The recent strong and sustained appreciation of the U.S. dollar (USD) raises questions about possible financial spillovers to emerging markets (EMs). The global economy is steering away from the Great Recession, but the recovery is still uneven, with marked divergences in the pace of growth among major economies. Specifically, the U.S. economy has gathered strength, suggesting a normalization of Federal Reserve monetary policy in the next few months. In contrast, growth in the euro area and Japan is still subdued, and their monetary policies are easing further. Reflecting these divergences in the outlook and expected monetary policies, the USD has appreciated considerably against most major currencies, especially the euro and the yen, over the past year. The USD has also strengthened vis-à-vis most emerging market currencies, particularly those of commodity-exporting economies. Historically, periods of sharp USD appreciation have been associated with an increased number of external crises in emerging markets—hence a key concern relates to possible spillovers from a sustained period of USD appreciation on the financial stability of EMs, specifically through effects on global capital flows, exchange rates, and EMs’ balance-sheet exposures. To summarize the case for how the USD drives markets. The strength in the USD has had a negative effect on US growth (NY Fed) The markets may not be fully prepared for when the Fed actually raises rates because of high valuation, excessive investor complacency and the fact that the Fed may be behind the curve (Paulsen) . In addition, there is a vast USD 9 trillion in offshore USD loans to EM credits that create a high degree of vulnerability with unknown contagion effects (IMF and others). Despite all these potential negatives, the Trend Model has improved from a "risk-off" reading to "neutral", largely because of an improving Europe. As the chart of the STOXX 600 shows, European stocks rallied on the news of a resolution of the Greek impasse and the index remains above both the 50 and 200 dma. 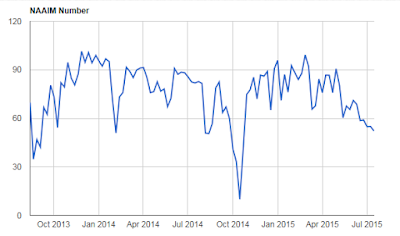 These signs of market strength shifted the composite model from negative to neutral. From a macro viewpoint, the growth outlook in Europe is improving. Callum Thomas pointed out that the recent ECB bank loan survey is suggestive that the eurozone may grow as fast as 3-4%, which is an astounding rate for the region. The Trend Model signal has also been aided by stability and slight improvements in the US outlook. 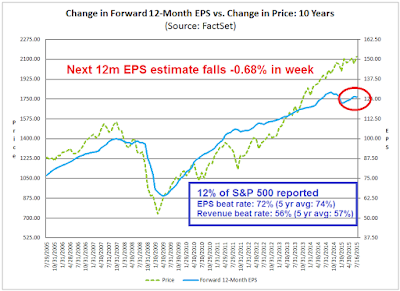 The latest update from John Butters of Factset indicates that this earnings season is turning out to be a fairly typical one. With 37% of the SPX components reporting, the earnings beat rate is slightly above average and the revenue beat rate is slightly below average. 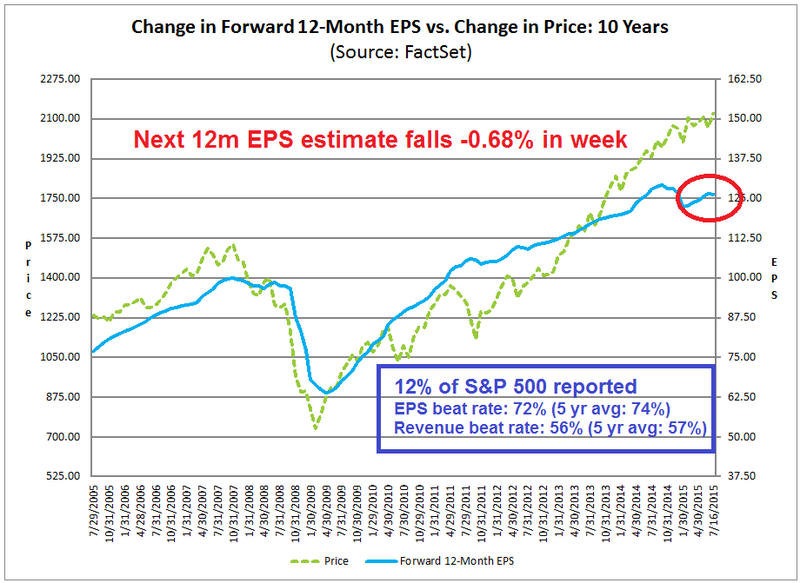 The most important metric is the evolution of the forward 12 month EPS estimates, which is rising again after experiencing a minor hiccup last week. As the 10-year history of the chart shows, stock prices are highly correlated with forward EPS (annotations are mine). The combination of an improving Trend Model reading, which translate into a trading buy signal, and possible tail-risk from Fed tightening suggests a scenario where US equities are likely to be choppy and range-bound until the likely September FOMC interest rate liftoff meeting. I would caution, however, that the bullish view is only a trading and not an investment call, I continue to believe that US equities are forming an intermediate term top. Doug Ramsay of Leuthold Group is the latest of many to call for a market top because of poor breadth and narrow leadership. 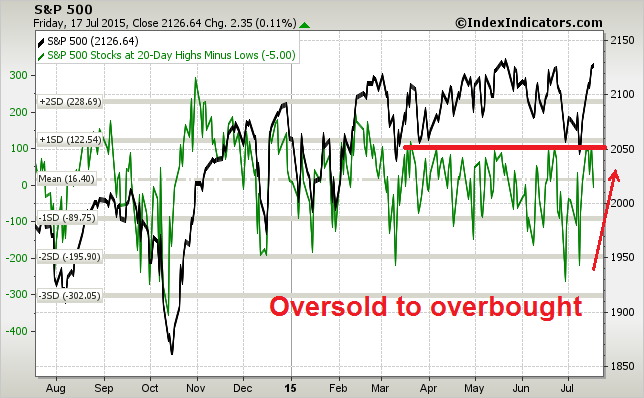 The chart below is only one example of the abysmal market breadth which was evident for most of 2015 and accelerated to the downside in the past couple of week. 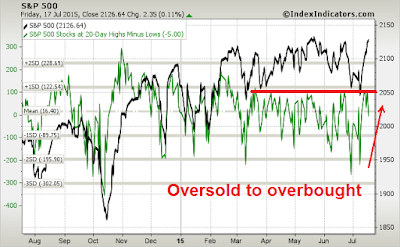 Under the circumstances, traders should be tactically focused on trading overbought and oversold readings until the intermediate term market direction is resolved. 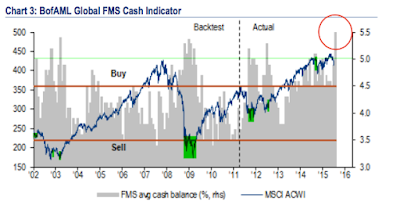 Last week, the trading model flashed a sell signal after a short-lived buy signal (see From oversold to overbought to...). Little did I expect that stock prices would flip back to an oversold condition after registering overbought readings a week ago. 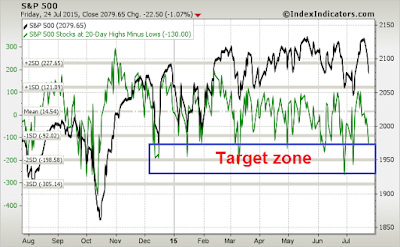 Longer term (5-10 day horizon) indicators such as the net 20-day highs - lows, however, show that readings are barely in oversold territory and stock prices could move lower before seeing a durable bottom. My inner trader realized some profits last week and he is staying flexible in the week to come. 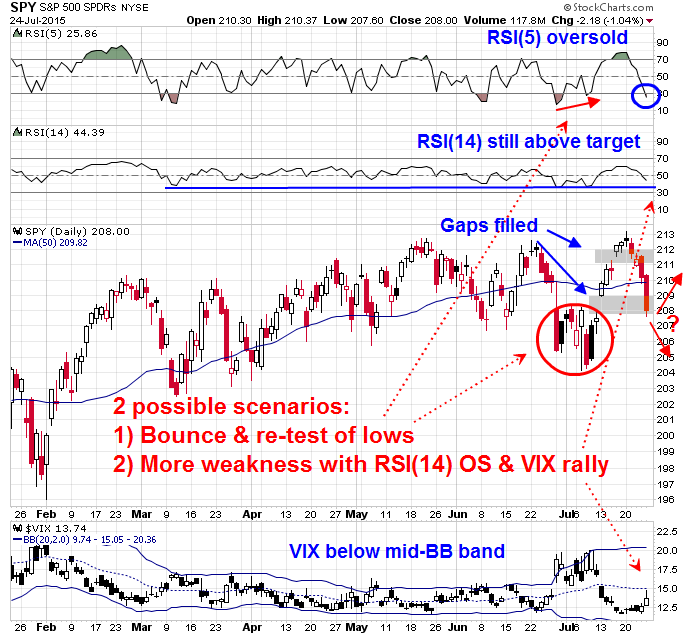 I have two likely scenarios in mind for the coming week, which are shown by the annotations in the chart below. An assessment of market conditions indicate that 1) trading gaps have been filled; and 2) stocks are sufficiently oversold on RSI(5) that a bounce is highly likely. 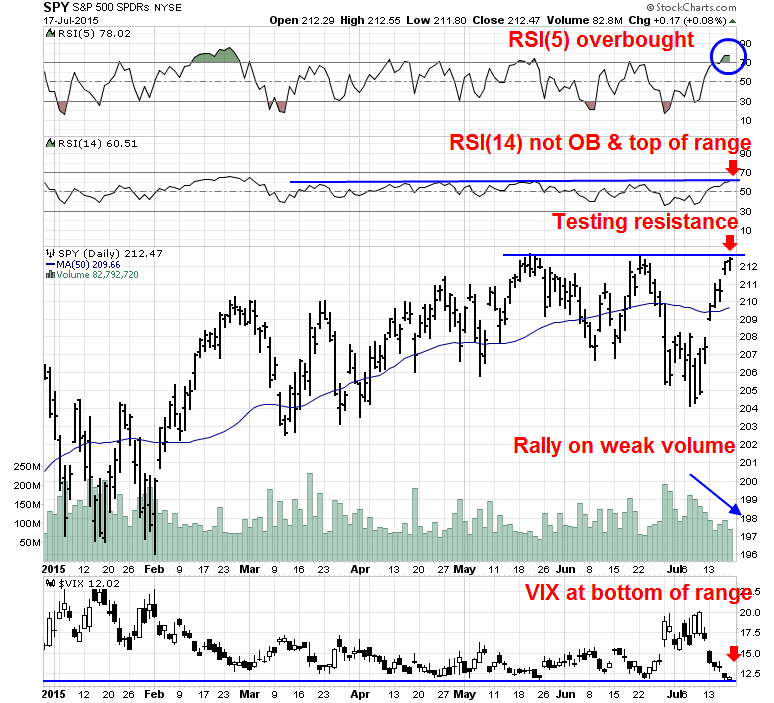 However, the lack of even a 2015-style mild oversold reading on RSI(14) and the inability of the VIX Index to rally above its 20 dma suggests that there may be some limited downside to this market. My first and preferred scenario calls for a brief 1-2 day rally, followed by a decline and re-test of the lows set on Friday. 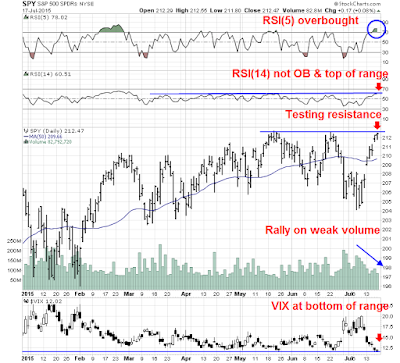 The template for this action (remember that history rhymes but doesn't repeat) is the market action in late June and early July, where the market fell to an initial low (as it did on Friday), rallied and weakened again to test the previous low, but saw non-confirmation on momentum indicators such as RSI(5) on the re-test. 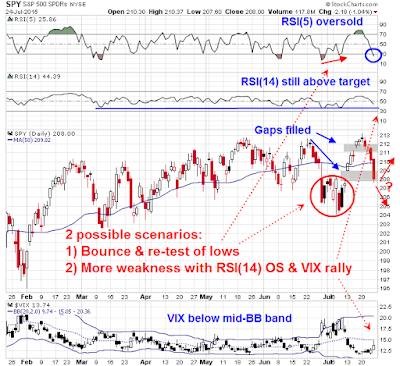 The second but less likely scenario would see the market continue to fall on Monday to make a durable V-shaped bottom. Both of these scenarios would be followed by a rally to a possible test of the old highs. The main reason for the choppy outlook because sentiment has deteriorated to a crowded short reading. 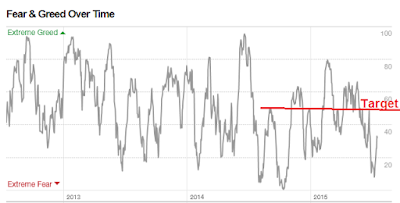 As an example, the CNN Money Fear and Greed Index is already at an extreme reading. It would be difficult to envisage a major bearish impulse starting from these levels. 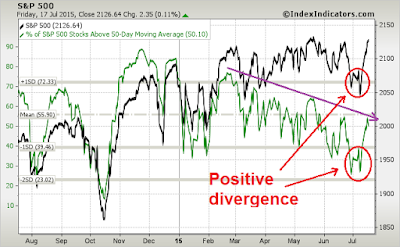 I would like to see sentiment improve to at least a neutral reading before a corrective phase could begin in earnest. My inner investor`s asset allocation remains at policy targets. He continues to hope for a market downdraft so that he can buy stocks at much cheaper prices. Can Alexis Tsipras become the Greek Lula? Greece has taken a crucial step towards a bailout after its parliament passed a second set of reforms. The passage of the measures means that negotiations on an €86bn European Union bailout can begin. Among those who voted against were 31 members of his own Syriza party. However, this represents a smaller rebellion than in last week's initial vote. Mr Varoufakis wrote (in Greek) that he felt it was important to preserve the unity of the government, even if he believed the programme was "designed to fail" by Greece's creditors. Here are the two basic scenarios that I am working with. Either Tsipras' ultimate objective is to take Greece out of the euro, which would also put their EU membership at risk, or there will be a deal. If there is a deal, everyone will have to save face. The EU will make Greeks swallow tough Grand Plan restructuring reforms. At the same time, they will be able to demonstrate that the Greeks are taking sufficient pain that the other euroskeptic parties watching this drama will be deterred from taking the same path. The Greeks will get some form of back door debt relief, either as NPV debt writeoffs or some form of aid in the form of humanitarian or military aid to help with their budget. In other words, it will be the typical European fudge solution. Everything else is theatre. Now that the Tsipras government has surrendered to virtually all Eurogroup demands, the theatre continues, but on an more optimistic note. A Nixon in China moment? Alexis Tsipras, the Greek prime minister, has the chance to play a role for his country analogous to the roles played by Korean President Kim Dae Jung in 1997 and Brazilian President Luiz Inácio Lula da Silva in 2002. Both of those presidential candidates had been long-time men of the left, with strong ties to labor, and were believed to place little priority on fiscal responsibility or free markets. Both were elected at a time of economic crisis in their respective countries. Both confronted financial and international constraints in office that had not been especially salient in their minds when they were opposition politicians. Both were able soon to make the mental and political adjustment to the realities faced by debtor economies. This flexibility helped both to lead their countries more effectively. The two new presidents launched needed reforms. Some of these were “conservative” reforms (or “neo-liberal”) that might not have been possible under more mainstream or conservative politicians. But Kim and Lula were also able to implement other reforms consistent with their lifetime commitment to reducing income inequality. South Korea under Kim began to rein in the chaebols, the country’s huge family-owned conglomerates. Brazil under Lula expanded Bolsa Familia, a system of direct cash payments to households that is credited with lifting millions out of poverty. This raises a key issue that the Tsipras government and many others misunderstood throughout the Greek crisis: the role of constructive hypocrisy in Europe’s political economy. Gaps between public statements and private intentions open up in all political systems, but these become huge in a complex multinational structure like the EU. On paper, the Greek bailout will impose a fiscal tightening, thereby aggravating the country’s economic slump. In practice, however, the budget targets will surely be allowed to slip, provided the government carries out its promises on privatization, labor markets, and pension reform. In short, the main conditions now seem to be in place for a sustainable recovery in Greece. Conventional wisdom among economists and investors has a long record of failing to spot major turning points; so the near-universal belief today that Greece faces permanent depression is no reason to despair. The scale of these problems makes Greece’s task sound hopeless, but simple reforms could have a big impact. Contrary to its image in Europe, Greece has already made moves in this direction: between 2013 and 2014, it jumped a hundred and eleven places in the World Bank’s “ease of starting a business” index. And reform doesn’t mean Greece needs to abandon the things that make it distinctive. In fact, in the case of exports, the country has important assets that it hasn’t taken full advantage of. Greek olive oil is often described as the best in the world. Yet sixty per cent of Greek oil is sold in bulk to Italy, which then resells it at a hefty markup. Greece should be processing and selling that oil itself, and similar stories could be told about feta cheese and yogurt; a 2012 McKinsey study suggested that food products could add billions to Greece’s G.D.P. Similarly, tourism, though it already accounts for eighteen per cent of G.D.P., has a lot more potential. Most tourists in Greece are Greek themselves, a sign that the country could do a much better job of tapping the booming global tourism market. Doing so would require major investments in improving ports and airports, and in marketing. But the upside could be huge. Greece also needs to stem its current brain drain. It produces a large number of scientists and engineers, but it spends little on research and development, so talent migrates abroad. And there are other ways that Greece could capitalize on its climate and its educated workforce; as Galbraith suggests, it’s an ideal location for research centers and branches of foreign universities. To implement such changes, Greece will have to overcome other problems. Reforms work best when the level of trust in political institutions is high. 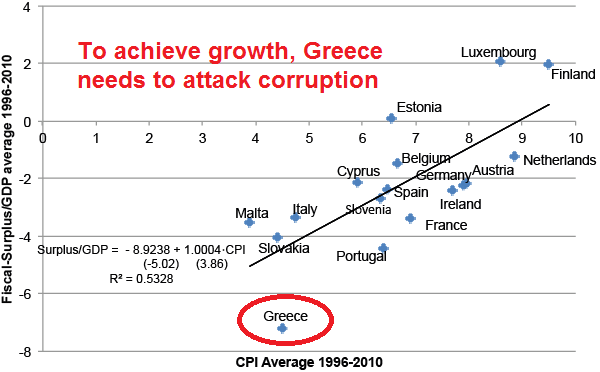 But the Greek state has a poor reputation among citizens, who see it as a pawn of special interests. (This distrust of the government is one reason for the country’s notoriously high rate of tax evasion.) On top of this, the chief advocate of structural reform to date has been the much hated troika, whose obsession with austerity has made the mere notion of reform anathema. Opening up the Greek economy would benefit ordinary citizens, since the economy’s myriad rules and regulations serve mainly to protect the wealthy and those lucky enough to have won a sinecure. But that’s a hard sale to make at a time when people are worried about holding on to what they have. As numerous Greek MEPs opposed the Eurozone summit deal, implementation will require a broad coalition of political parties. This column argues that corruption in Greek politics will prevent the formation of such a coalition. The heavy debt service leads parties to invent extreme ways of responding to super-austerity and to strongly oppose direct reforms that challenge existing clientelism. The way out is to sign a new agreement that combines debt restructuring and radical transparency reforms, including naming-and-shaming practices, to block clientelism in the medium and long run. Correlation between the fiscal-surplus/GDP ratio (in percentage points) and the Corruption-Perceptions Index (CPI) for Eurozone countries (t-statistics in parentheses). In the case of Greece, coalition governments have never been broad across parties, and reforms have progressed slowly, despite the intense monitoring by the IMF (Campos and Coricelli 2015). According to the theory suggested by Achury et al. 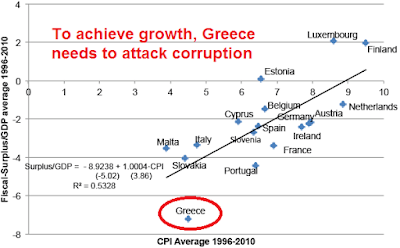 (2015), the corruption problem in Greece, combined with its high debt-to-GDP ratio, has led Greece into a trap. The ideal long-run solution to Greece’s problem would be to eradicate rent-seeking groups in politics. However, this requires time and a deep understanding of the problem. The short-run solution would be to restructure Greek debt, postponing payments and giving enough time for economic recovery. This short-run strategy could make benefits from a broad-coalition government more attractive to political parties, because it would take away the debt-servicing burden. The working hypothesis is that some rent-seeking activities would still be speculated by parties (Achury et al. 2015, Sections 2.5, 3.1.2, and 3.1.4). Of course, such debt restructuring requires a new agreement. And certainly the EU should ask for reforms in exchange for debt restructuring. Whether these reforms could solve the corruption problem (or not) in the long run, is a matter of understanding the roots of the corruption problem in Greek society. A small but critical mass of citizens and politicians break the rules of fair play and equitability against the law. Businesses that do not pay their taxes oblige other businesses to do the same in order to survive competition. Skilled young people who apply for civil servant jobs are obliged to invest in clientelistic political connections, after seeing inapt persons obtaining such jobs. Citizens see their taxes ending up in the private pockets of people they know, but are unlikely to win a court case because of the political support for involved persons. Lawful citizens, knowing that taxes will not finance public goods but private benefits, are unwilling to pay their income taxes, becoming friendly to parties that promise lenience regarding tax collection. The list can go on and on, but the issue is not morality. It is the technical perils of a coordination problem that ends up in prisoner’s dilemma situations that arise in everyday life. The sad equilibrium is that Greek citizens do not feel equal among equals against taxpayer law. A feeling of social mistrust pervades citizens, especially young people. Alexis Tsipras did a complete U-turn after the "no" result in the referendum and acquiesced to creditor demands. Can he do it again to implement the kinds of reforms outlined above? If so, he will achieve the mantle of the Greek Lula. [M]any fund managers say they are buying tech shares now. Valuations are a fraction of what they were before the crash in 2000, and top technology firms appear to be building world-class franchises that could generate large profits for years to come, analysts and investors said. And though the U.S. economy continues to expand, sales and earnings in many sectors of the economy are flat or falling, highlighting the relative promise of the technology sector. “Growth is really scarce right now,” said Josh Spencer, portfolio manager of the T. Rowe Price Global Technology Fund, which manages more than $2 billion. Google is one of the fund’s top holdings. “The reality is that global GDP is just not that exciting. You really get a premium if you can show organic growth,” or rising revenue excluding acquisitions. “What’s different this time around is we’re seeing sustainable growth and real profits in a lot of cases,” said Dan Fletcher, research analyst on Neuberger Berman’s Large Cap Disciplined Growth team. He said the stock prices of large technology firms generally aren’t worrisomely high, but some unprofitable smaller companies have become very expensive. Paradigm shifts, or wild claims? I’m biting back. I’m biting back because I worry that this line of thinking is only going to create a whole bunch of suckers who are going to be scammed. Technology does have the potential to save the day. But technology alone will not be responsible for this. What bothers me about “fintech” in particular is that it assumes digitisation alone can help influence behavioural shifts. But really there only two ways that fintech can bring affluence to developing markets. 2) By anticipating your wants and needs through mass surveillance and data capture, and then manipulating them if they don’t fit the resources to hand, to the point you’re not really free at all. Have you noticed how many new age companies are dependent on advertising for their revenue? What leading growth company isn't counting on ads to make their business model work? The powerful tech and social media companies like Google (including YouTube), Facebook (Instagram) and Twitter generate most of their revenues from advertising, and we read every day about new companies that have built an app, website or game to deliver advertising. The disconnect? Are there enough advertising dollars to support the established mediums (television, radio, newspapers, banner ads, billboards, sports sponsorships) and justify the valuations of the newcomers? It seems almost certain that the conventional media will continue to lose market share. Dollars currently being spent on newspapers like The Globe and Mail or "The News at Six" will be re-allocated to shared photos, a tweet and Grand Theft Auto 22. And if the new providers can improve advertising effectiveness through enhanced analytics and precise targeting – i.e. deliver more revenue per advertising dollar – it makes sense that the advertising pie will grow substantially. If Molson and McCain Foods get more bang for their buck, they’ll spend more bucks. But it seems to me, from an investment perspective, something has to give. The advertising pot is finite. Either conventional media will disappear more quickly than expected, or the total capitalization of the new media players will go through a correction. I'm betting on both. How inconsistencies in the market resolve themselves can have a profound impact on future investment returns. If you believe they're unsustainable, then you need to understand how they will eventually re-connect. Even if we were to set aside the unfriendly market reception to the earnings reports of AAPL, MSFT and YHOO, the chart below shows that growth and momentum stocks appear to be extended. The middle panel is the relative performance of the Russell 1000 Growth Index vs. the Russell 1000 Value Index. This ratio has gone straight up in the past few days. 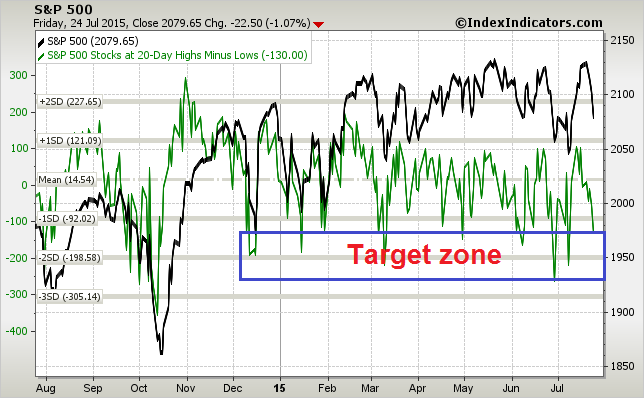 Even if you are bullish on growth stocks, do you want to be chasing them here? The bottom panel shows the relative performance of the momentum stock ETF (MTUM) relative to SPY. MTUM is in a relative uptrend but also appears extended when compared to the market. From a fundamental and technical perspective, do you really want to be chasing the glamour growth stocks right now? After the euphoria, what next? The trading model turned bullish last week, but I warned that the "trading model 'buy' signal flashed this week may turn out to be very short-lived, depending on how the market action develops" (see Back to our regular programming (of 2011)). Indeed, the SP 500 advanced 3.9% from an oversold oh-no-Greece-oh-no-China-the-world-is-going-to-end extreme to an overbought buy-buy-buy-Greece-and-China-are-solved reading in the space of seven trading days. Let's go through these issues, one at a time. In the week just past, the Greek parliament passed the package of "reforms" demanded by the Eurogroup as a pre-condition for rescue funds. In addition, various eurozone parliaments passed resolutions approving a bridge loan for Greece and giving authority to the national government to negotiate a third Greek bailout. These resolutions were passed in key countries, namely Finland and Germany. As well, the ECB came to the rescue by raising the ELA limit for the Greek banking system. The can has been kicked a little bit down the road. According to IMF staff projections, the eurozone will either have to cough up a lot more than they ever expected to rescue Greece, or give them interest-free loans for the next 30 years. Greece’s productive know-how corresponds to a much lower GDP per capita, far below that of its peers, even after years of economic contraction. It effectively has an export basket with similar sophistication to that of Tunisia supporting a lifestyle like Sweden. Conclusion: The good news is already in the market on Greece. There will be more drama and ups and downs of negotiations in the next few months. Expect the perception of Grexit to rise again. 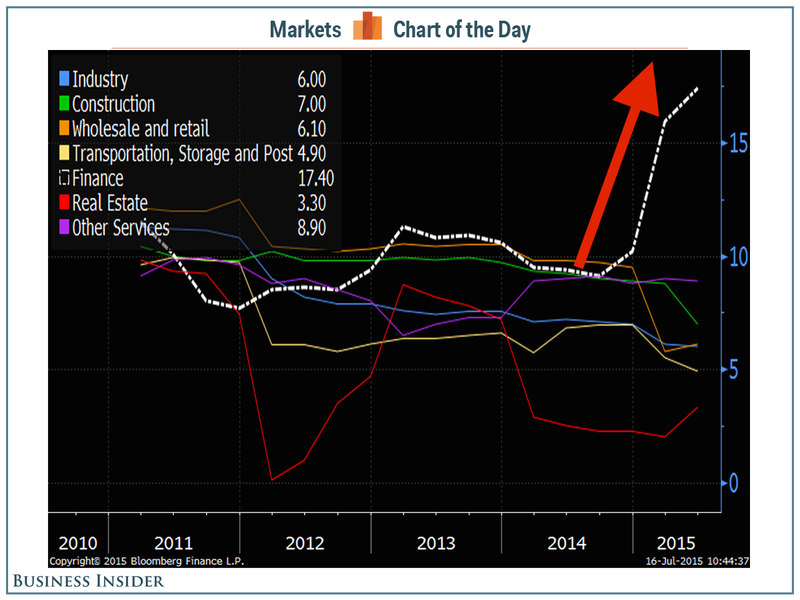 China: Don't look at the stock market! The gyrations of the Chinese stock market is mesmerizing, but I have urged readers to avoid paying attention to that market as it is not truly reflective of China's economy. 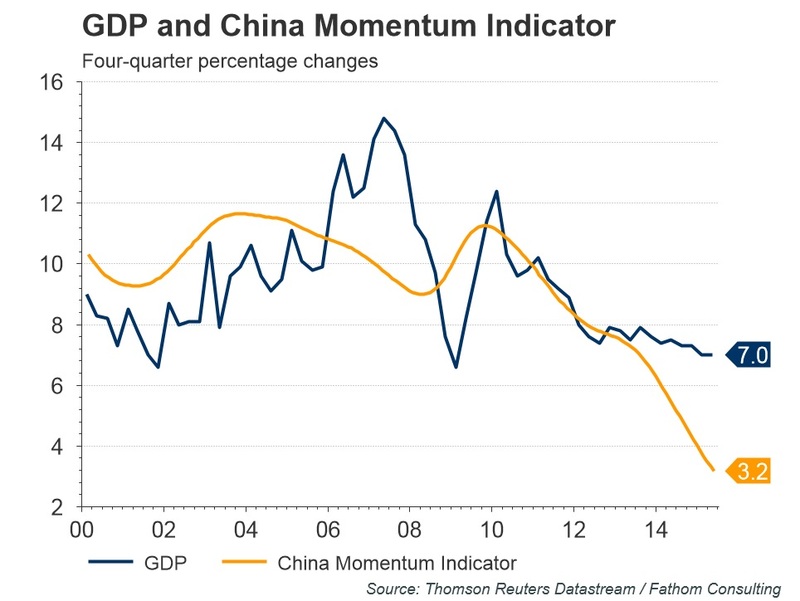 Pay attention to the more important matter, which is the fact that Chinese economic growth is slowing. Bloomberg's chief Asia economist Tom Orlik points out that the recent boom in the Chinese stock market boosted the financial sector, and caused it to grow at more than twice the growth rate of the whole economy. The sector may have added a whopping 0.5 percentage point to the GDP print, according to Orlik. Singapore is the closest thing Asia has to an economic barometer. Its highly open, trade-reliant economy usually signals when trouble is approaching the global stage. And at the moment, Singapore is flashing clear warning signs. The city-state's gross domestic product plunged 4.6 percent last quarter, a downturn almost certainly triggered by China. Singapore's plight may mark a dangerous inflection point not just for Asia, but for the entire global economy. After the 2008 global crisis, China's 9-percent-plus growth picked up the slack from a West licking its financial wounds. But as Asia's biggest economy cools, officials from Seoul to Brasilia are finding themselves without a reliable growth engine. Uneven recoveries in the U.S. and Europe have already slowed the exports that power most Asian economies, including Japan. China's downturn could now throw Asian manufacturing into reverse. The combination of slowing Chinese growth and Fed rate increase later this year could prove to be very bad news for many emerging market economies, such as South Africa and Brazil, as well as Asia. This is a key risk that does not appear to be fully discounted by the market. In the US, the economy seems to be stuck in second gear and starting to show signs of deceleration. 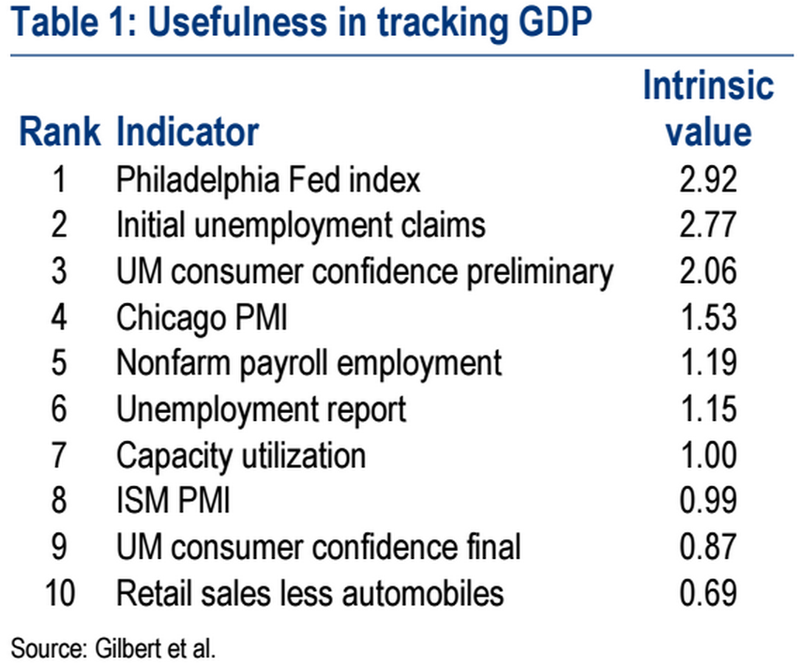 The BoAML economist pointed to a study of the usefulness of economic indicators, based on their timeliness, revision noise and the relation to fundamentals (via Business Insider). The top two indicators on that list is showing signs of slowdown. Here is a chart of the Philly Fed Index, whose YoY rate of change appears to be fairly well correlated equity returns - and the index is showing signs of deceleration. The second most important indicator, initial claims, is flashing signs that employment growth may be hitting its speed limit. (also see this analysis from New Deal democrat where he lays out the case that hiring is hitting a mid-cycle pause). Last week was the first week in four that initial unemployment claims have beaten expectations. 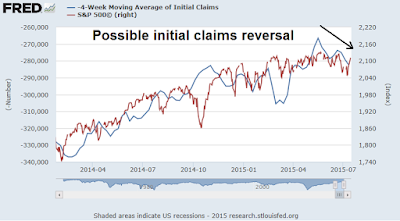 As a reminder, this chart shows the high level of correlation between initial claims (in blue, inverted scale) and stock prices (in red). 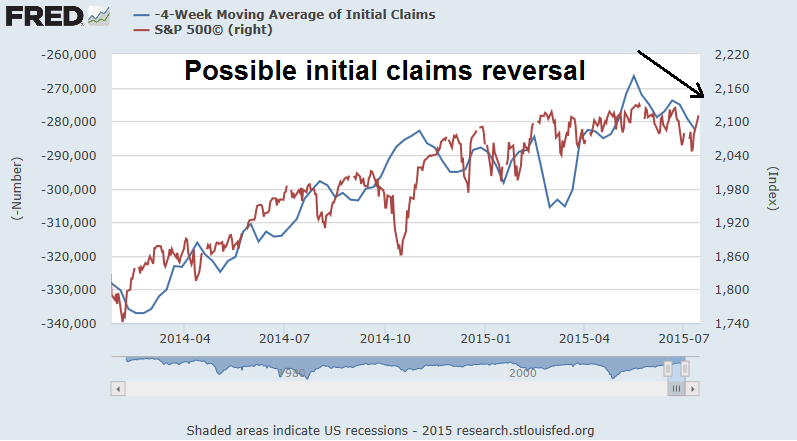 Here is a close-up of the above chart, which shows the worrisome uptrend trend in initial claims (recall the initial claims inverted scale where down=up). The bottom line is changes in growth outlook impact sales and earnings, which drive stock prices. 2Q earnings season is just getting under way and results are coming in a tad below expectations. 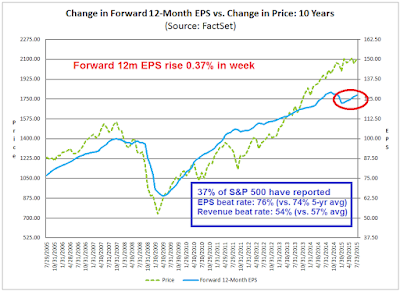 The latest report from John Butters of Factset shows that both the earnings and revenue beat rates are slightly below historical averages. 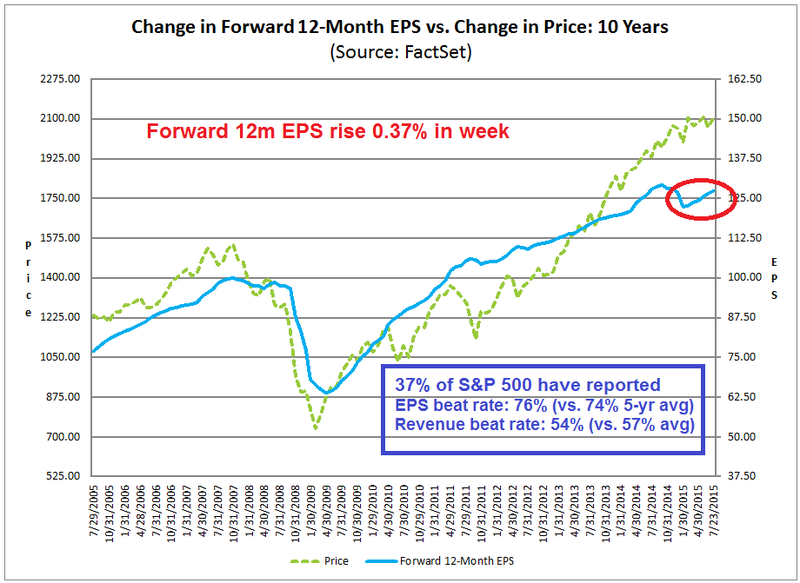 More importantly, forward EPS estimates have begun to tick down again, which is worrisome as the direction of forward EPS estimates have been highly correlated with stock prices (chart annotations are mine). Ed Yardeni provided some confirmation of the fundamental weakness. The YRI Fundamental Stock Market Indicator, which is described as a coincidental indicator of stock market strength, has been flat in the past few weeks and may be rolling over, even as stock prices have risen (annotations are mine). All of these possible negative macro and fundamental are highly preliminary, but they do serve as an advance warning of incipient weakness. As changes occur at the margin, further deterioration in macro and fundamental factors have the potential to depress stock prices. Jason Goepfert pointed out that the huge Friday NASDAQ advance was achieved on negative breadth, which has negative historical implications. 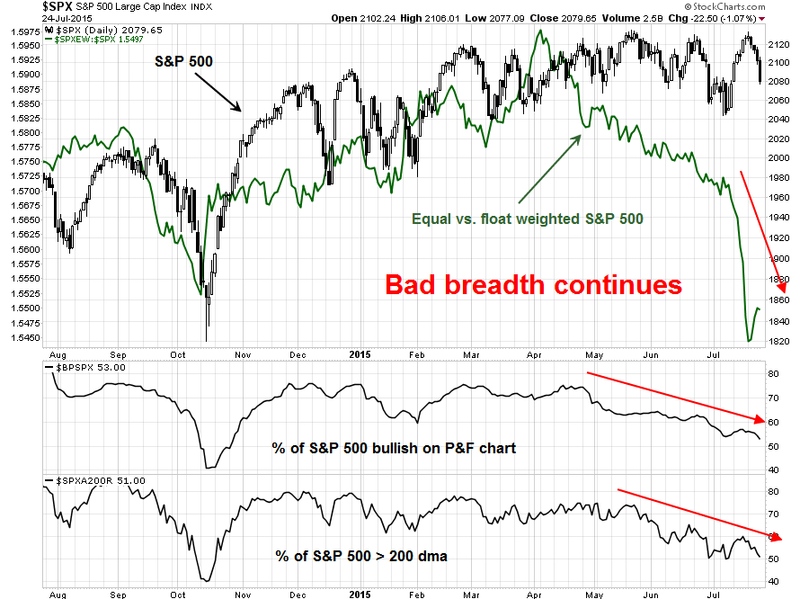 The SPX breadth picture wasn't much better. 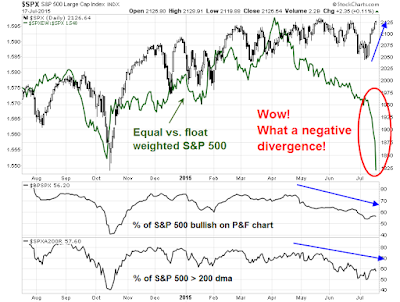 Even as the index advanced to test the old highs, the equal-weighted index dramatically underperformed the float weighted index, bullish percentage remained in a downtrend and the same could be said of SPX above their 200 dma. All of these are key indicators of non-confirmation of market strength. In addition, credit market risk appetite was not improving. As the chart below shows, the relative price performance of junk bonds against Treasuries is showing a pattern of lower lows and lower highs even as stock prices rallied. Here’s another straw in the wind that we’re close to a stock market top: Greed sells, while fear does not. I draw this worrisome conclusion from this week’s San Francisco Money Show, where hundreds of investment gurus are giving workshops and seminars to thousands of investors. I count on the fingers of one hand the presentations dedicated to managing risk and how to avoid losses. In contrast, there were numerous workshops catering to greed, with advisers enticing investors with the prospect of triple- and even quadruple-digit returns. 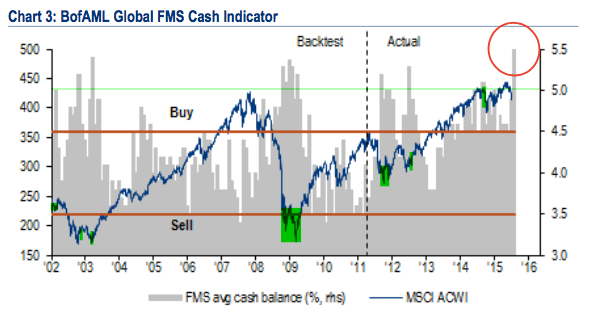 There was some excitement when the latest BoAML Fund Manager Survey showed a high cash level, which is contrarian bullish. However, Urban Carmel pointed out that an examination of manager sector weighting showed them to be overweight high-beta sectors and underweight defensive sectors. So call that result a wash. Despite these negatives, I could find a few silver linings in the dark cloud from other sentiment indicators. The latest survey of NAAIM managers, which consists of RIAs who mainly manage retail money, shows that their equity exposure is falling hard, which is contrarian bullish. 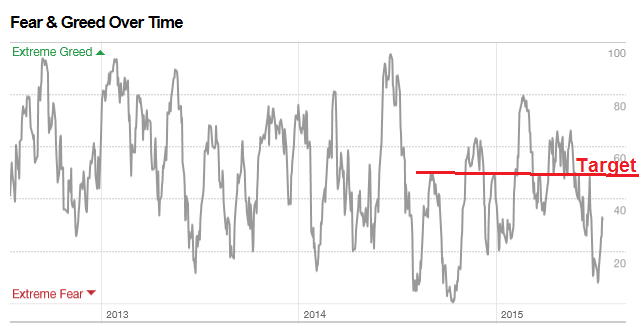 Despite the flaws in its construction, the CNN Money Fear and Greed Index is still showing a bearish reading. Stock prices may not be ready to stage a major retreat until this index gets back to at least a neutral level. I interpret these readings as the market being overbought, but not sentiment models need to return to a more neutral condition before a sustainable drop can be seen. Last week ended with SPY, the SP 500 ETF, rallying on falling volume and ended the week testing a key resistance level, RSI at either overbought levels or at resistance and VIX trading at a keys support. 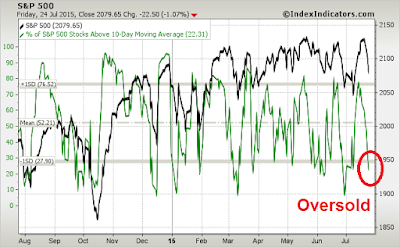 In the meantime, this chart from IndexIndicators shows that the market has screamed upwards and moved from an oversold to an overbought condition in a very brief period. 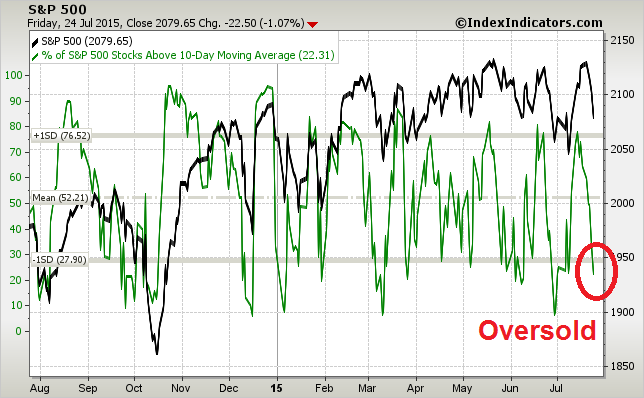 Moreover, the tick down of the last couple of days in the net 20-day highs-lows is also indicative of the breadth deterioration that have I pointed out. 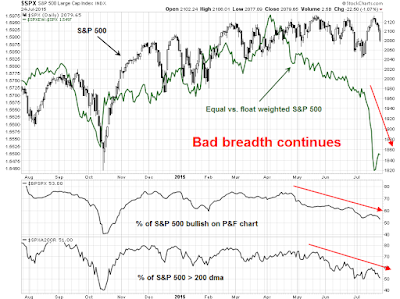 Notwithstanding the breadth divergences, which may not matter over a one-week time frame, these conditions are worrisome. The most obvious conclusion that I can draw is the market is likely to decline and retrace its gains in the week ahead. Even if you were bullish and believed that the market is likely to break out to new all-time-highs, it would be difficult to be buying here with so many overbought readings across the board. This chart of the % of stocks above the 50 dma may outline a possible possible scenario that resolves the excessively fear readings in the Fear and Greed and other sentiment indicators.We see the deterioration even as the market advanced (purple line). 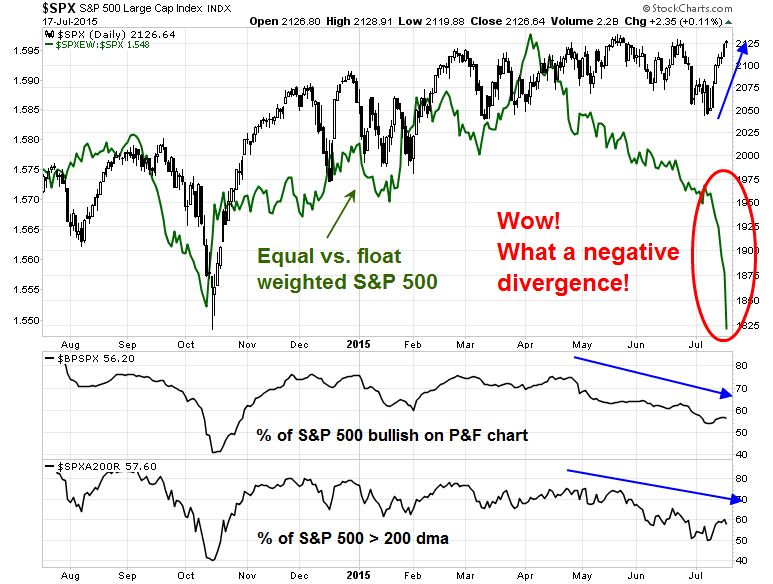 A pullback and rally could see bullish sentiment improve, but see the mirror image of the positive divergence seen about a week ago (in red circles) of the indicator as the SPX grinds up again to test the highs again. If a pullback does emerge, then the bulls' first key test is holding the 50 dma at the about 2100 level. Bottom line: Expect a near-term bearish bias early in the week but further market volatility in the days ahead. My inner trader took profits on his long positions last Wednesday and took a preliminary short position in the markets Thursday. He is staying flexible and waiting to see how the market reacts in the days ahead before taking on further commitments. My inner investors remains calm and he has some dry powder so that he can pick up stocks at lower levels. There is minimal risk of a recession on the horizon and therefore a major bear market is highly unlikely. Can you actually replace an analyst with a robot?